False lashes... I love how the look but bloody hell I've had a bit of love-hate relationship with them! Applying them in the past was nothing short of a nightmare. I would apply them but they wouldn't go on properly, fall off or simply go on unevenly. I actually went a few years without wearing false lashes because I was sick of trying to get them on right LOL. 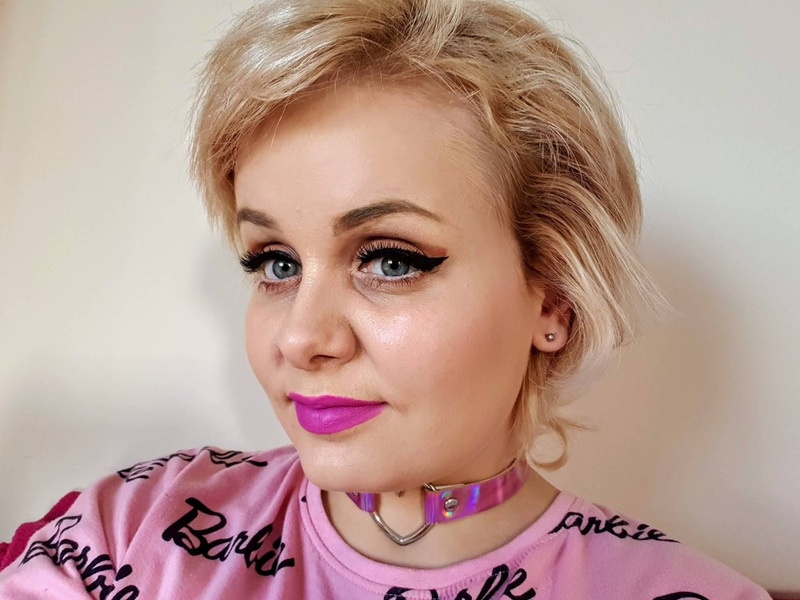 I have also found rouge lashes in places unexpected and me being frightened of spiders thought they were spiders and I bloody nearly jumped out of my skin! Now jump forward a few years I may not be perfect at applying them still but I do find it easier than before and I manage to keep in place, so that's a win-win right? 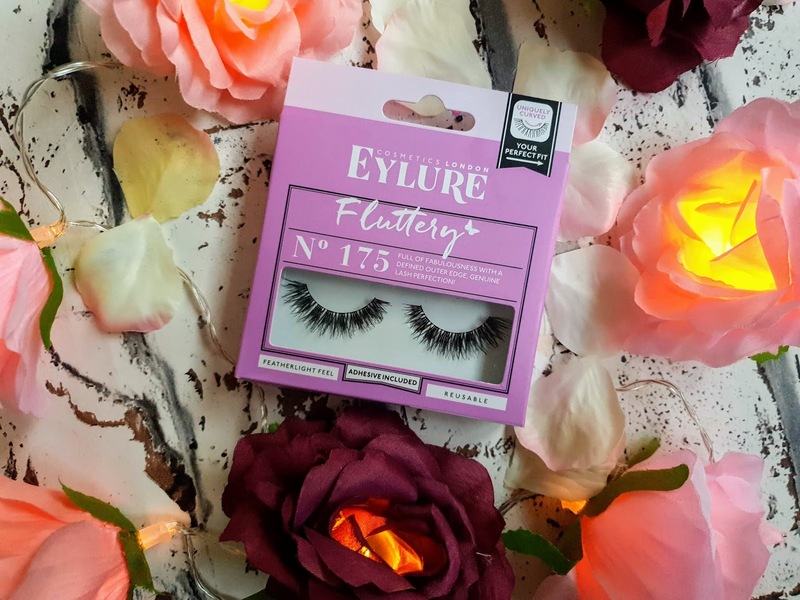 Eylure is a false lashes brand I just love! I first bought their lashes last year when I wanted to look fabulous for a family wedding. Ever since the wedding, I have worn mostly their lashes since and I just love them. 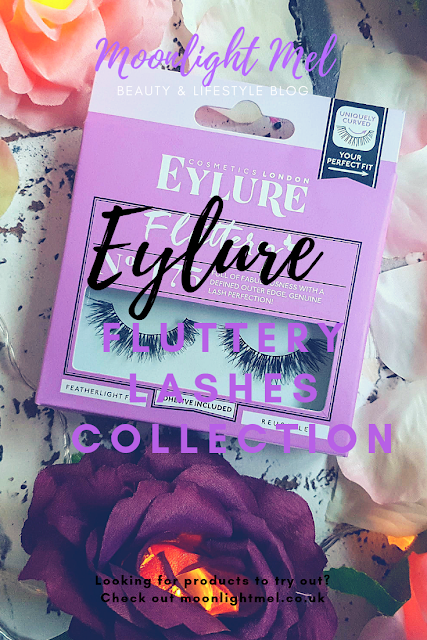 I was kindly sent these Eylure Fluttery Lashes to try and they are from a range of 6 different types and styles. I just love the fluttery ranges pastel purple packaging, it sure stands out with that and also the fluttery design on it too as it has a lovely butterfly next to it. 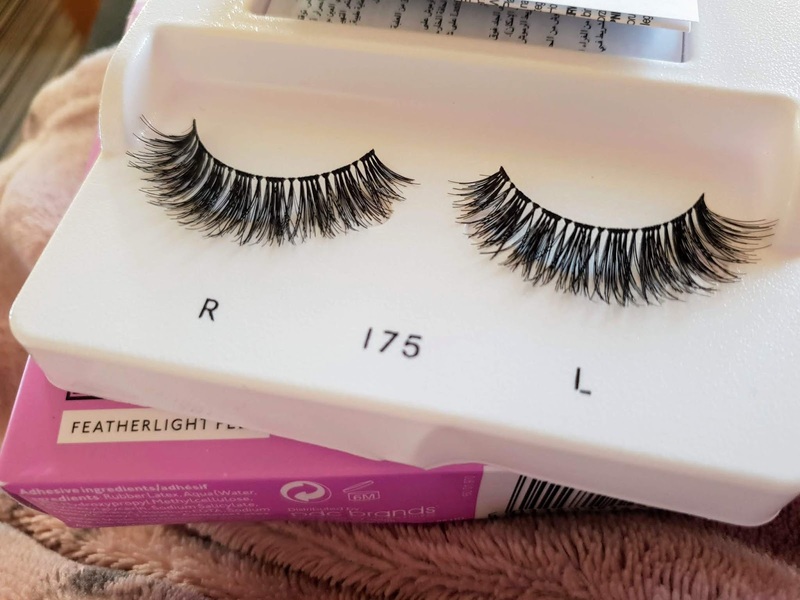 Another thing I love and something that helps me choose before buying is they is a model on the back of the packaging which shows you what the lashes look like on which is a big help choosing, don't you think that too? The lashes themselves are very defined and also have a curved outer edge ( looks fabulous with winged liner). So in the Fluttery range, they are 6 different styles of false lashes to choose from and they cost about £5.95 each. I will tell you a bit more about them below. Fluttery No.178 - full and fabulous for a fuller lash effect. Below is how Fluttery No.175 looks! I think they look perfect! As with all my lashes, I measured them on my eyelid first to make sure they fit. Once I know I cut them to the size I need ( this applies to all lashes I use, it makes wearing lashes much more comfortable, without poking my eye LOL). Once Im ready I apply the lash glue which is included with the lashes, then I wait about a minute before supplying to my lids ( wait for it to become tacky, makes it easier to stick rather than applying straight away). Out of all my lashes I have tried from Eylure, these have to be the most comfortable I have tried! They fit the shape of my eyes nicely. I love how full they make my lashes look and also they just make my winged liner look that extra bit fabulous don't you think? Have you tried Eyelure lashes before? if so which are you're favourite?